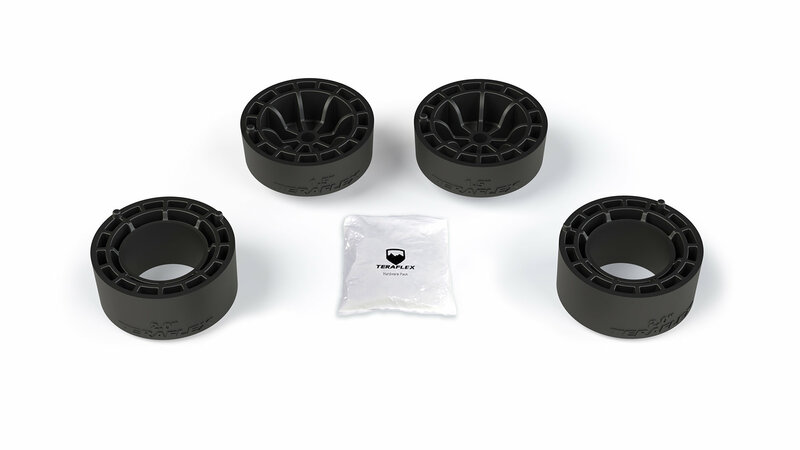 If you need extra clearance for off-road excitement, trail blazing, or over-landing adventures then definitely consider the 1.5" Performance Spacer Lift Kit for Jeep Wrangler Unlimited JL from Teraflex. Maybe you're looking at aftermarket bumpers, winches, and roof racks to beef up your 4-door JL. Consider this lift kit to compensate for all of that added weight. The lifted ride height will also compensate for the weight of any gear that you might be hauling as well as give your rig a more aggressive stance by getting rid of factory front-end rake. Note* Max Tire Diameter of 33" applies to Wrangler Unlimited JL Sport, Sahara, & Rubicon model Jeeps. Extra Clearance to tackle more aggressive off-road terrain. Compensate for Extra Weight of aftermarket bumpers, winches, & racks in addition to any extra gear or cargo you may be hauling. Leveled Stance for those who want to eliminate factory front-end rake. Compatible with original or stock-length aftermarket shock absorbers. Installed this evening. It took the 4 hours with simple tools and jacks. Only issue is mounting the rear spacers. It is difficult to reach the top of the bolt. It took some time, but finally got it done.